Basra: Scientists have made a surprising discovery in the waters off the coast of Iraq: a coral reef made up of more than half a dozen species of the marine animals. A team of divers from the Freiberg University of Mining and Technology in Germany and the Marine Science Centre at the University of Basrah in Iraq captured of the murky waters where the Shatt Al Arab river flows into the north-western portion of the Arabian Gulf. The river carries sediment — and frequently oil — into that portion of the gulf, which is often churned up by strong winds and currents. These conditions were thought to make the waters inhospitable to coral. But it appears marine biologists had underestimated the adaptability of these invertebrate underwater creatures. The reef they found covers an area of nearly 28 square kilometres and is seven to 20 metres beneath the surface, according to the study. The temperature and salinity of the waters there change rapidly, and visibility is low. Among the coral species identified were stony corals like Platygyra pini, Porites lobata, Goniastrea edwardsi, Astroides calycularis and members of the Tubastrea genus, which are also known as sun corals. There were also octocorals, which look similar to stony corals but don’t have a hard skeleton, including Junceella juncea. 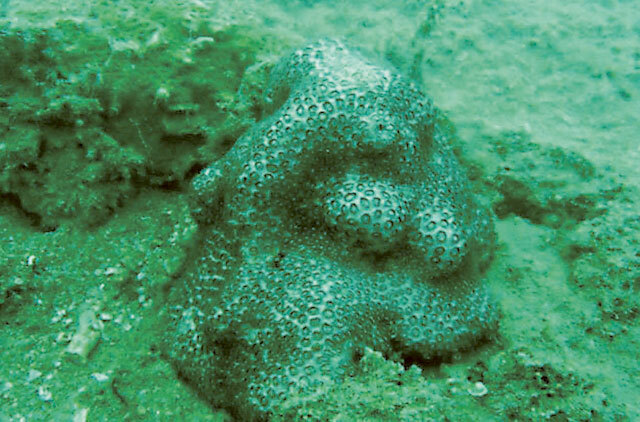 In addition to corals, the researchers found sponges, another type of underwater animal that lives in colonies. “To identify sponges in this marine environment was entirely surprising” because they were thought to be too delicate to live in waters with high concentrations of sediment, they wrote. Further study of the Iraqi reefs can help scientists understand how coral and other marine species will adapt to conditions brought on by global warming, the researchers said.